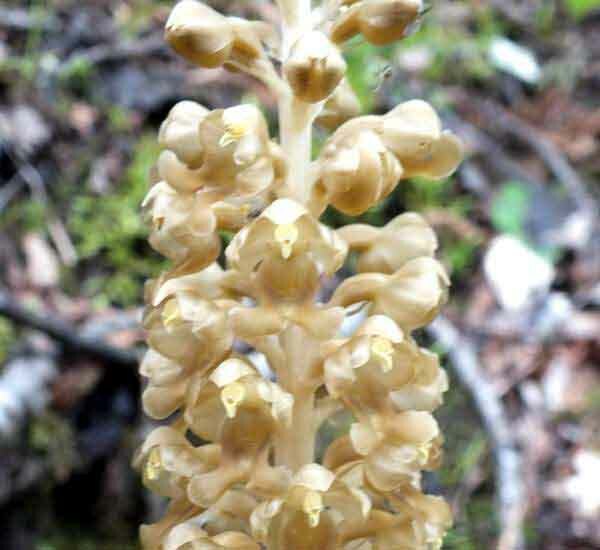 The name Bird's-nest Orchid refers to the tangled root system of the plant which is said to resemble a badly-made bird's nest. The plant is entirely lacking in chlorophyll (green pigment) which means that, unlike green plants, it is unable to make (photosynthesise) food from sunlight. It is entirely dependent for nutrients to germinate and grow on a host mycorrhizal fungus in the soil which is, in turn, dependent upon attachments to the trees in the woodland. Since all parties involved in this relationship survive it is clearly of mutual benefit. The resulting drab brownish-beige colour of the entire orchid plant often makes it difficult to locate in the dark, wooded habitats where it lives. The orchids grow to a height of around 40cm, and when they emerge from the soil in springtime, the flowerbuds are fully formed and tightly sheathed in bracts which gradually release as the flower spikes grow. 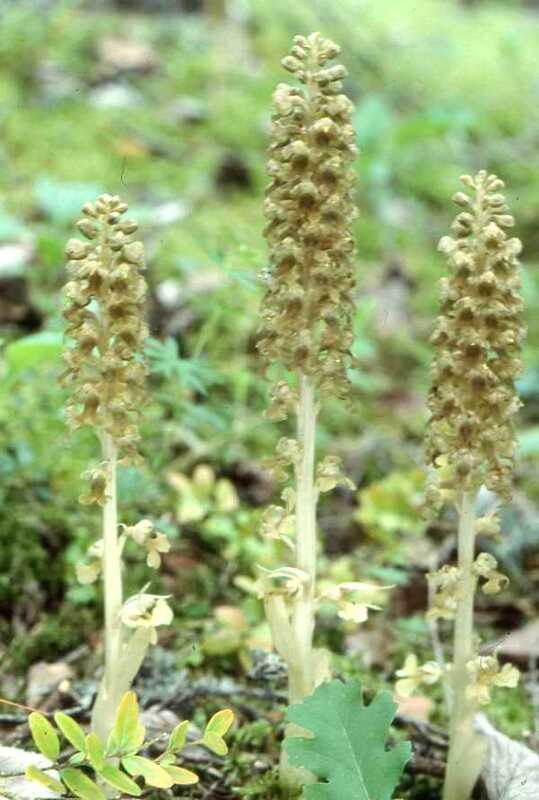 Bird's-nest Orchid is in steep decline due to loss of suitable deciduous woodland habitat which has either been eradicated altogether or converted to faster-growing cash-crop conifer woodlands. In areas where thousands of plants were once recorded only a few now remain. Its world range extends into Northern and Central Europe and further south towards the Mediterranean where it is largely confined to to mountain woodlands and forests. In Slovenia at the right time of year, these orchids appear in thousands. Not only are they inside woodland, they spill out on to roadside verges in huge clumps of flowers. No doubt, they occur in similar numbers in other Central European countries, too. This orchid occurs in Deep leaf litter in dark woodland habitats, and also in open woodland rides. The specimens shown on this page were found under lime trees in west Wales in early May (top), and in Beech woods in the Lot Valley in France in late April (left). 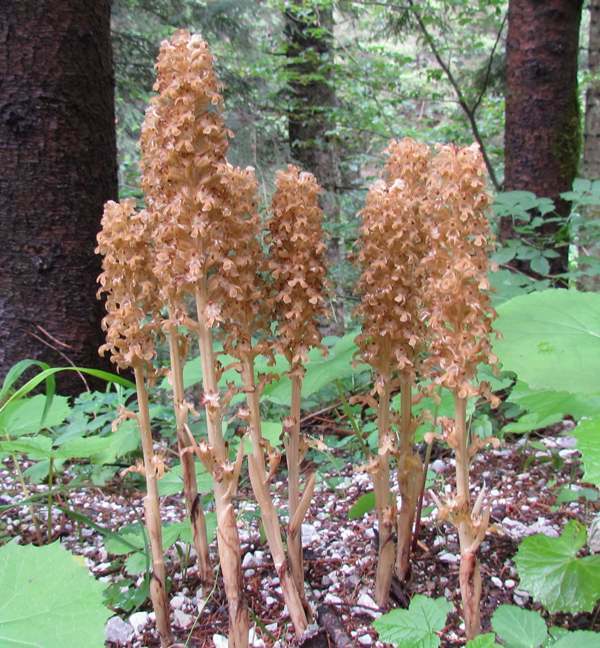 In the UK and Ireland Bird's-nest Orchids usually flower from early May to late June.